HANCOCK -- Finnishness is at a fever pitch in the Copper Country as the Heikinpäivä mid-winter festival gets underway in Hancock with opportunities for the whole family. A great way to get the entire family ready for Heikinpäivä is to come to Family Fun Night at 6:30 p.m. TONIGHT, Friday, Jan. 22, at the Finnish American Heritage Center. 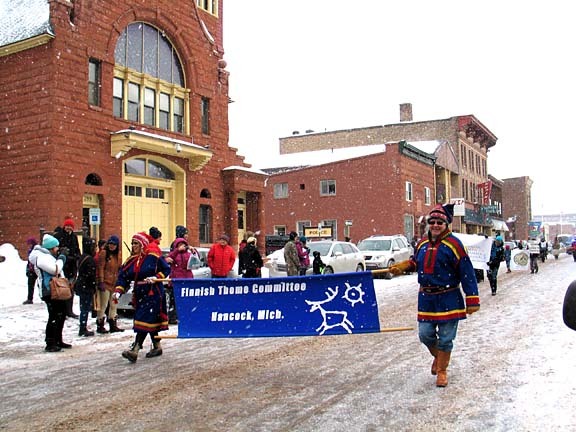 Kids of all ages (4 – 94) will have a grand time doing traditional Finnish song games, taught by Kay Seppala. In addition, instructors from Salolampi Finnish Language camp will lead families in organized learning through play activities. Refreshments will be provided. Reservations are requested, but not required. $5 per family. Call 523-6271. Then, at 2 p.m. on Sunday, Jan. 24, the Heikinpäivä Hymn Sing and Concert takes place at Zion Lutheran Church in Hancock. This is a wonderful opportunity for folks of Finnish descent to enjoy many of the hymns that have been familiar in Finnish congregations of the area for decades. The Hymn Sing is free and open to the public. Monday, Jan. 25, includes a full slate of enrichment classes, all of which take place at Zion Lutheran Church. For $10 per person, per class, you can learn Finnish folk music techniques, gluten-free baking, or arm knitting. Ralph and Jaana Tuttila of Minneapolis, Minnesota are this year’s Heikinpäivä artists in residence, and as their first order of business they’ll be providing instruction in playing Finnish folk music in their course "Finnish Folk Music -- Many Voices." The class will be offered at 2 p.m. and 6 p.m. Monday. $10 per person. The Tuttilas are known well for their work with the Minnesota-based Finn Hall Band, which has performed in the Copper Country numerous times. Also at 2 p.m. and 6 p.m. Monday, Edith Mäki, the longtime proprietor of Spice of Life Bakery in Hancock, will teach folks how to bake gluten-free items. Using the "from scratch" techniques for which she’s been known for years, Edith will share some tips on how to provide some tasty treats that every one of your friends and family will enjoy. $10 per person. And, new to the festival this year, Painesdale resident Terri Taavola Wuorinen will lead a course in arm knitting at 2 p.m. and 6 p.m. To take this class, you’re asked to bring two skeins of No. 6 yarn. Even if you’ve never knitted before, you’ll surely learn this technique in short order and begin crafting your own original items. Advance registration for Heikinpäivä enrichment classes is appreciated. To sign up for your favorite classes -- and to register your friends at the same time -- call 482-1413. It’s been played by folk musicians for more than 600 years, but the nyckelharpa isn’t an instrument that’s a regular part of the music scene in the Copper Country. 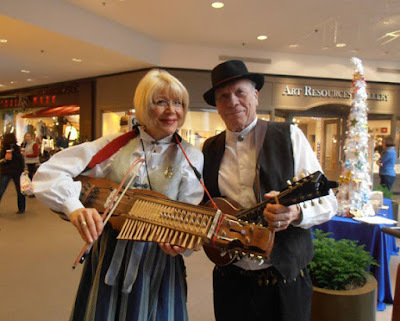 Minnesota-based musicians Jaana Tuttila and Cheryl Paschke, both members of the Finn Hall Band, will perform a variety of tunes on the nyckelharpa -- which is actually Sweden’s national instrument -- at a 7 p.m. concert Friday, Jan. 29, at Gloria Dei Lutheran Church in Hancock. The nyckelharpa or "key fiddle," has strings similar to a violin's, which produce tones by the drawing action of a bow. Evidence suggests the first nyckelharpas may have arrived from Germany as early as the 14th century. Both Jaana Tuttila and Paschke have played the instrument for a number of years, in solo performances and as part of the Finn Hall Band as a whole. JaanaTuttila and her husband, Ralph, are this year’s Heikinpäivä artists-in-residence. Their Finnish folk music course next Monday (see above) will include lessons on the nyckelharpa. They will also offer dance lessons -- Finnish tango and humppa -- at 6 p.m. Wednesday, Jan. 27, at the Finnish American Heritage Center. $10 a person. They’re also planning to make visits to area schools to introduce the next generation to the folk music traditions.